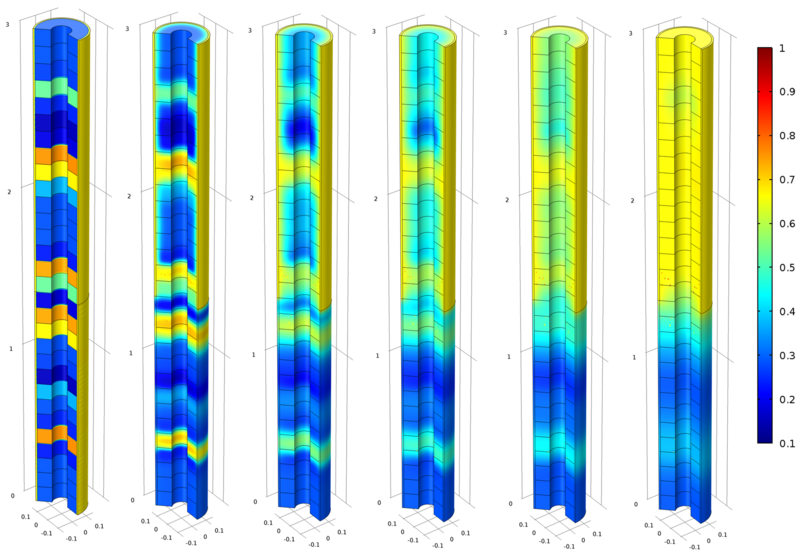 This post is about a recent application case of Comsol in the field of thermo-hydro-geochemical behavior of clayey materials that are planned to be used as engineering barriers for the deep geological repository of spent nuclear fuel in Sweden. Model calculations are compared with results of a full-scale in-situ experiment performed at the Äspö Hard Rock Laboratory (Sweden). The Swedish Organization for Radioactive Waste Management, SKB, plans the disposal of spent nuclear fuel in a deep geological repository. Bentonite clay is planned to be used around the cylindrical waste packages as buffer material due to its low permeability and high swelling properties. 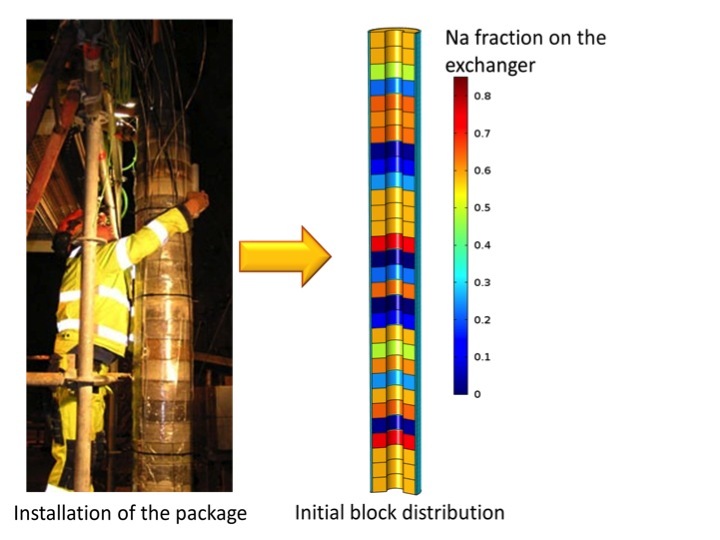 To assess alternative clay materials, SKB started a field experiment in 2006  where packages of different types of compacted bentonite hollow cylinders were placed and heated (> 100 ºC) from the inside to target values during ~2.5yr (Figure 1). 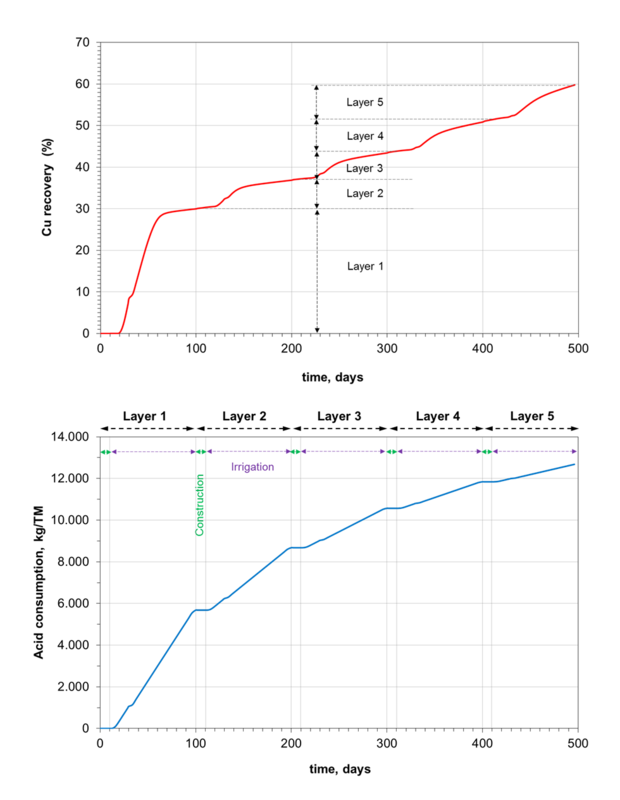 Post-mortem analysis indicated that initially contrasting cation-exchanger compositions between different bentonite blocks significantly homogenized already after 880 days (Figure 2). The question arose of whether these observations can be reasonably well described by our conventional tools and understanding of the underlying processes. Installation of the package and conceptualization in Comsol model. 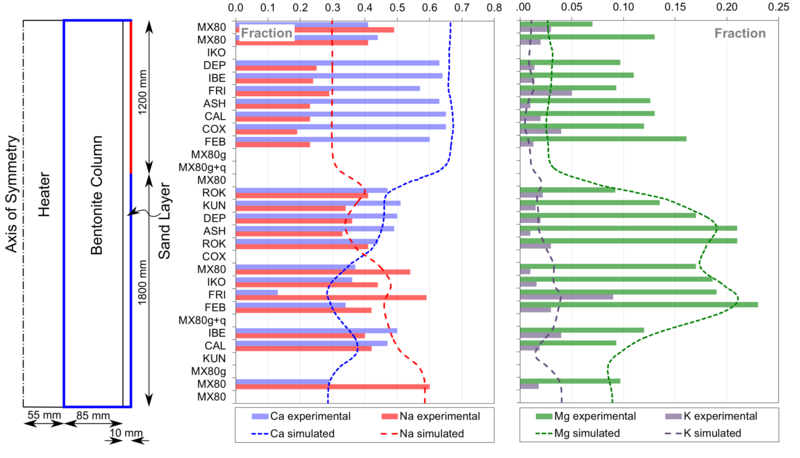 Initial (before) and final (after the experiment) exchanger composition in terms of unit fraction Na, Ca, Mg and K occupancy (empty: no data available). To verify whether a simple reactive transport model coupling diffusion, cation-exchange and temperature evolution can explain the observed homogenisation of cation-exchanger composition, a simplistic geochemical model was implemented in Comsol and coupled to physical processes. The model considers different porewater compositions for each clay material assuming chemical equilibrium and only 5 ionic species: Na+, Ca2+, Mg2+, K+ and Cl-. Fickian diffusion (coupled to temperature evolution based on experimental data) is the only transport process while cation-exchange is the only type of chemical reactions implemented. The implementation of diffusion uses the “Solute Transport” Interface, while cation-exchange is set through a system of coupled non-linear algebraic equations. Transport-Chemistry coupling uses the approach proposed in  and solved using Operator Splitting. More details can be found in . In conjunction with a composite boundary type (Figure 3) based on fracture logging measurements, the simple model is capable of reproducing the experimental data with reasonably good accuracy, especially for the dominant cations (Ca and Na). A relatively poorer fit for Mg is observed in the top (although still unclear, it could be due to additional chemical reactions or altered groundwater composition). Thus, we see how a very simple model (Figure 4) can be very useful to gain insight in the experiment evolution and serve as a basis for discussion between experimentalists. The model independently showed that part of the homogenization is most probably due to the higher water renewal in the fractured zone of the deposition hole. Left – schematic representation of the model domain and its boundaries (blue: no-flux, red: constant concentration). Right – final experimental and simulated exchanger compositions (after 880 days) across the package. 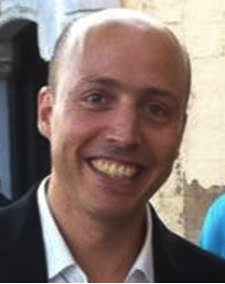 Svensson D. et al., 2011. Alternative Buffer Material – Status of the ongoing laboratory investigation of reference materials and test package 1. SKB TR-11-06. Saaltink M. et al., 1998. A mathematical formulation for reactive transport that eliminates mineral concentrations. Water Resources Research, 34, 1649-1656. Idiart AE, Pękala M, Nardi A, Arcos D, 2012. Reactive transport processes in compacted bentonite. Application to a prototype experiment of underground repository for nuclear waste. Int. Meeting Clays in Natural & Engineered Barriers for Radioactive Waste Confinement, Montpellier, France. This work was made possible by the financial support from SKB and has been conducted at Amphos 21 by Marek Pekala, Andrés Idiart, Albert Nardi, and David Arcos. Their contributions are gratefully acknowledged.